THE BIG BLACKOUT - OUR FRAGILE SOCIETY! Truly, "All we like sheep have gone astray; we have turned every one to his own way" (Isa. 53:6). Notice, in Luke 22:14, 19-20: "And when the hour was come, he [Jesus] sat down, and the twelve apostles with him.... And he took bread, and gave thanks, and brake it, and gave unto them, saying, This is my body which is given for you: this do in remembrance of me. Likewise also the cup after supper, saying, This cup is the new testament in my blood, which is shed for you." Notice, it was "when the hour was come," that Jesus first introduced the bread and the wine. 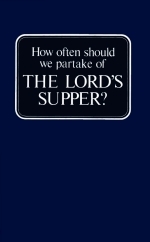 There was a definite time — a definite hour — when He held this supper, setting us an example. Notice, too, He commanded them to observe it — "THIS DO." And why? "In remembrance of me," Jesus said. It was, then, a MEMORIAL — in memory of His death. He instituted it on this tragic night, the very eve of His death. Jesus knew His time had come. He sacrificed for us (I Cor. 5:7). After sundown (the days began at sundown) Jesus sat down with His twelve disciples in an upper room (Matt. 26:20; Mark 14:15). And as they were eating the Passover supper (Matt. 26:26), "Jesus took bread, and blessed it, and brake it, and gave it to the disciples, and said, Take, eat; this is my body. And he took the cup, and gave thanks, and gave it to them, saying, Drink ye all of it; for this is my blood of the new testament, which is shed for many for the remission of sins." The lamb was killed as the sun was going down (Deut. 16:6), yet it was eaten in the 14th day (Lev. 23:5, 6), not after it was passed. Now notice Exodus 12:17, 24. The Passover was instituted an ordinance forever. Some will say circumcision was not done away, but was changed — today it is in the heart (Romans 2:29). In both cases God meant forever, and so, as we have seen, at the last Passover supper Jesus changed the manner of observance of this ordinance. No longer do we kill a lamb and eat it, since the Lamb of God has been sacrificed once and for all. Instead, we take the bread, symbolizing His broken body, and the wine, symbolizing His shed blood, as a memorial, looking back to His death. Now notice Exodus 13:10, speaking of the Days of Unleavened Bread: "Thou shalt therefore keep this ordinance in this season from year to year." The time is once a year, at night, after the sun has set in the beginning of the 14th of Abib. "Go ye therefore," Jesus said to these same disciples, "and teach all nations, baptizing them ... teaching them to observe all things whatsoever I have commanded you." So they were to teach us to observe all things whatsoever He commanded them. Surely God is no respecter of persons. Now notice I Corinthians 5:7, 8: "Christ our passover is sacrificed for us: therefore let us keep the feast, not with the old leaven ... but with the unleavened bread of sincerity and truth." It says "as often" as we observe it, "ye do show the Lord's death till he come." And Jesus commanded, "This do ye, as oft as ye drink it, in remembrance of me" (verse 25). We do it in remembrance of THE LORD'S DEATH — a memorial of His death. And memorials of momentous occasions always are observed annually, once a year, on the anniversary of the event they commemorate. That is the way we observe the 4th of July, Armistice Day, etc. Jesus instituted this New Testament ordinance on the eve of His death. It was the 14th Abib, Hebrew calendar. He was our Passover, sacrificed for us — and He was sacrificed on the same exact day of the year that the Passover lambs always had been slain. As the Old Testament Passover commemorated Israel's deliverance from Egypt, a type of sin, so the New Testament Lord's supper — a continuation of the Passover with different emblems — commemorates Jesus' death, and our deliverance from sin. Immediately after that last supper, Jesus and His disciples went out to Gethsemane, where, later that night, Judas Iscariot led the bloodthirsty mob who seized Jesus, and led Him away to be crucified during the daylight part of the same 14th day of the month. Jesus set us an example, and by following His example and observing this sacred ordinance at the same time He did — the same time the Passover always was observed, commanded to continue FOREVER — we do continue to remember His death, annually, on the very anniversary of His crucifixion. It is the most solemn and sacred occasion of the year — especially when observed at this correct scriptural hour. The Days of Unleavened Bread were still being observed. Notice Acts 20:6: "And we sailed away from Philippi after the days of unleavened bread". That was about 59 A.D. Some churches turn to Acts 20:7 — "And upon the first day of the week, when the disciples came together to break bread ...." To them this says take the Lord's supper every Sunday morning. "Break bread" does not necessarily refer to the "Lord's supper," as some have carelessly assumed. Notice Acts 27:34, 35: "Wherefore I pray you to take some meat ... he took bread ... and when he had broken it, he began to eat." Notice Acts 2:46: "... And breaking bread from house to house, did eat their meat with gladness ...." Here they were breaking bread daily, eating meat, and Paul says if we eat to satisfy hunger at the Lord's supper, we do it to our condemnation (I Cor. 11:34). The first day of the new year begins near the spring equinox when the new moon usually is first visible to the naked eye at Jerusalem (not the United States). The Jewish calendar as used by Jews today is correct. But it must be remembered that "in the 14th day of the first month at even is the passover, and in the 15th day of the same month is the feast." The Jewish people no longer observe the Passover on the 14th. They observe the FEAST — one night after the Passover, on the eve of 15th Abib. The "Lord's supper" or New Testament Passover should be observed after sunset on the evening before the Jewish people of today celebrate their feast.